A 2017 case is a stark $300,000 reminder that the IRS is not bound by statements made by its employees, such as Revenue Officers. Tommy Weder was a responsible officer of a corporation which failed to pay its payroll taxes, and as a result, he was assessed a trust fund recovery penalty (TFRP) pursuant to IRC Section 6672. After he paid the $300,000, he filed suit in federal district court in Oklahoma requesting a refund. 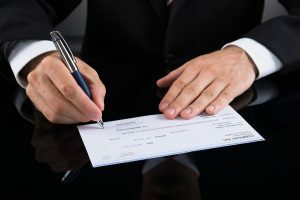 His theory was that the company had paid $300,000 towards the trust fund taxes, and that, therefore, his personal liability was reduced by that amount. In most cases, a taxpayer must pay any tax in full (not just a portion) before he or she can file a suit for a refund. However, under the so-called Flora rule, payroll taxes are divisible taxes, therefore, the taxpayer must only pay the tax due for one employee for one quarter. The IRS took the position that the payment was not properly designated toward the trust fund, and that it was therefore entitled to, and did, apply the payment towards non-trust fund taxes owed by the company, which of course doesn’t reduce the trust fund recovery penalty. Weder didn’t dispute that there hadn’t been a written designation of tax. The payment had been made through the IRS’ EFTS system, and there was no designation. Weder argued, however, that the Revenue Officer that had been assigned to collection had met with representatives of the company, including its CPA, and that the Revenue Officer had demanded that the payment be made through EFTPS, and represented that the payment would be applied to the trust fund taxes.